Situated on one of the most spectacular red rock view locations in Sedona, the property is tucked along a hillside ridge of dedicated forest service area, home to wildlife which includes deer, javelina, bobcat, coyote and the powerful symbol of freedom, eagles. This one-bedroom King suite is comfortable, spacious and modern decorated in warm colors with a mix of western art and photography throughout. It features a large bathroom with a glass-enclosed shower and granite countertops. This suite is alongside our beautifully landscaped grounds where you will enjoy the barbecues, bocce court, water feature and a fire pit. 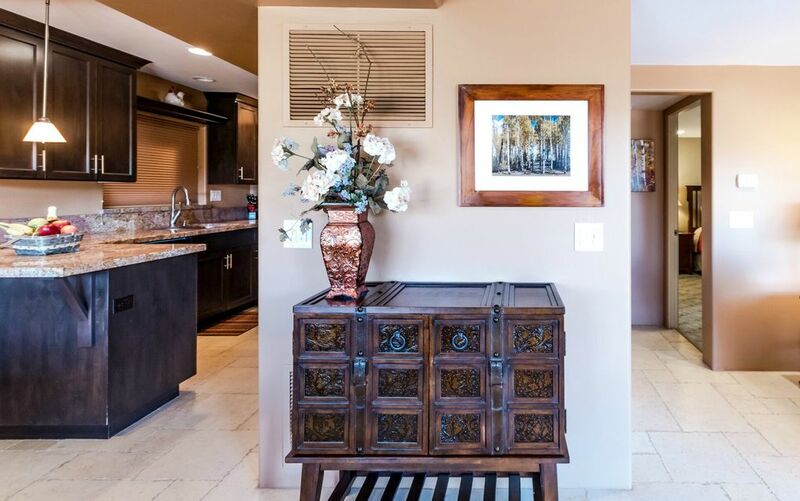 Our Luxury Vacation Rental Condos are located in a peaceful area of Sedona's bustling uptown district and literally backing up to Coconino Forest wilderness. Your secluded and quiet home away from home is only five blocks from the most popular pedestrian strip in uptown Sedona. We are just above Hillside Sedona, a collection of art galleries, distinctive dining & specialty shopping. Down the hill from your condo, a scenic bridge spans Oak Creek, inviting you to pause for reflection, enjoy a Creekside espresso, and explore the Tlaquepaque Arts and Crafts Village. At the banks of Oak Creek and fashioned after a traditional Mexican village, Tlaquepaque offers specialty shops and outstanding restaurants. You can relax on your own private deck and take in the vistas of Sedona's famous red rock monuments and views of Uptown. The unit features a private patio with dining table and chairs. A covered parking space and additional open paved spaces are available on site. Venture outside, as the sumptuous digs are granted complimentary access to Marg’s Trail, a moderate level hiking path, which leads to an array of the most scenic maze of intercepting Sedona trails. Directly on the property enjoy access to the gardens with the bocce court, water features, and barbecue patios. Red rock views and hiking. Bocce ball court and courtyard. Water feature. Bocce Ball. Handicapped Accessible (may have limitations). Mountain View. Covered Parking. Location and accommodations were great. Loved the extra goodies upon arrival. Views fantastic! We spent 3 nights at this beautiful property and enjoyed everything about it. It was spacious, clean, comfortable and the views were amazing! Two of Sedona's best restaurants (Cafe Elote and The Hudson) are within a few minutes walk of the unit and the trailhead for Marg's Trail is just steps away. Highly recommended! Great property, great views, great service! We loved our recent visit to Vista Ridge, unit 1. The location was perfect and the views were amazing! The condo was very comfortable, clean and had everything we needed. Owner was very responsive and check in/check out was perfect. We look forward to staying here again! Great location, close to town. Spectacular view. Condo was clean, nicely decorated. Only suggestion would be for brighter light over bathroom sink, and a mirror in the bedroom. Comfortable , clean , beautiful views. Got this for my friends who were here for my 60th. They absolutely LOVED it. Thanks for making it special for them too!! Across from Tlaquepaque in Uptown Sedona. 50% deposit for all stays.